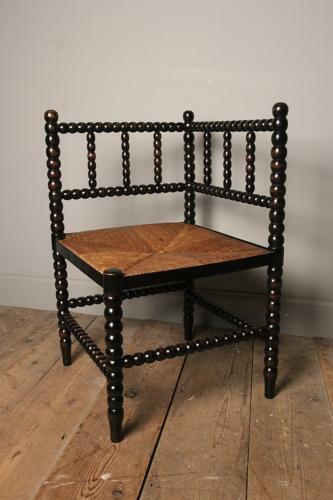 A wonderful example of the 1890 Liberty & Co "Norfolk Chair" , featured in their Christmas campaign in 1890 priced at 10/6. This small ebonised Bobbin Chair with the original Rush seat of which is in excellent condition. Retaining the original finish with good even colour and patina throughout. In strong and sturdy condition with no repairs or replacements. English, London, 1890.